Your exposition of Irving Lerner as an adherent to the Worker's Film and Photo League was important to a better understanding of his work. I find it ironic that the same studio that shamefully crushed distribution of Losey's M eight years before would support Lerner's work - maybe it was the death of Harry Cohn in early 1958 that made it possible for the studio to make pictures with Lerner. Lerner's pictures for Columbia - City of Fear and Murder by Contract are both obsessed with imagery from vehicles and with the specificity of the built landscape. There are so many striking and intelligently photographed images of the automotive landscape in City of Fear, and it seems that Lerner knew the city, or worked with someone who knew the city well. 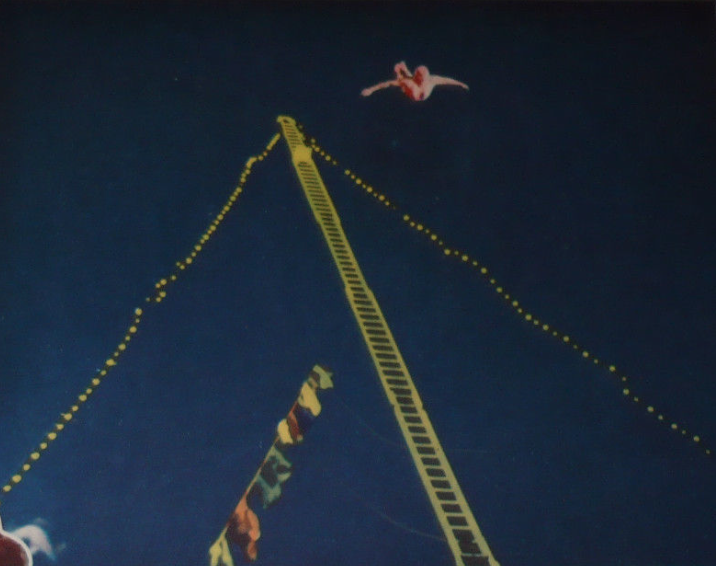 I thought I would contribute three images (out of many) that produce the optical unconscious of the film. 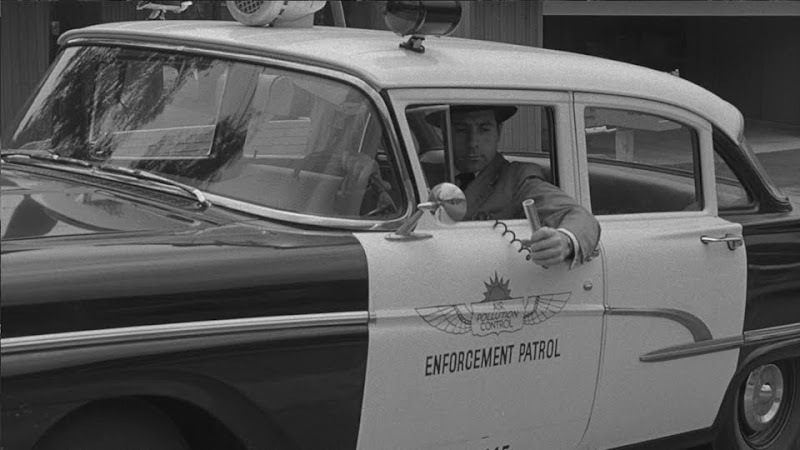 In 1959, California mandated that the Department of Public Health set standards for emission and control of air pollution, so the appearance of air cops would have been a perfect dodge for the Feds. Here we have the scientific police at work, casually sampling the Los Angeles atmosphere for radionucleotides. The insignia and identification of the side of the vehicle: "Air Pollution Control - Enforcement Patrol." 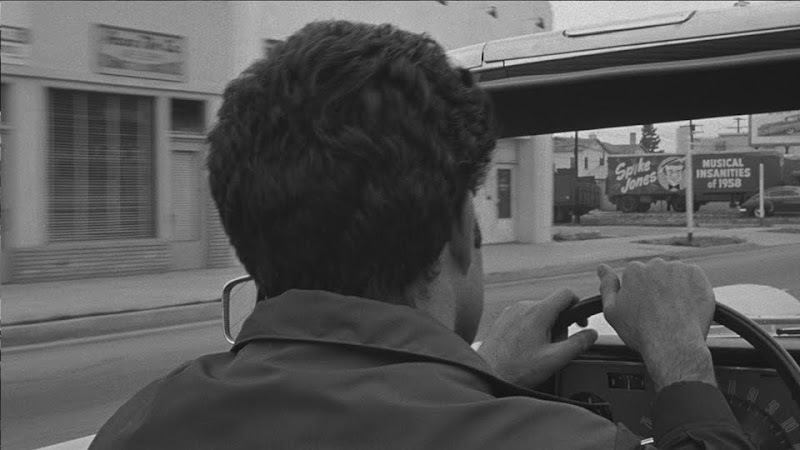 Here is a quasi-pov shot of Vince Ryker, already exposed to a lethal dose of cobalt, cruising through south Hollywood, top down, wind in his hair, and through the windshield, we see a truck ad for Spike Jones Musical Insanities of 1958. Finally, what may be the slyest of shots, another cruising image, another pov. Despite the exceptional quality of the photography, the pov trope gives some of the film a kind of home movie quality, the quality of being in and examining public space - the same sense we often get from Thom Andersen's films. There is a power to the liberty of this kind of seeing, which is at the other end of the spectrum from surveillance video. The shot is looking downhill at the intersection of Wonderland Avenue and Lookout Mountain Avenue. 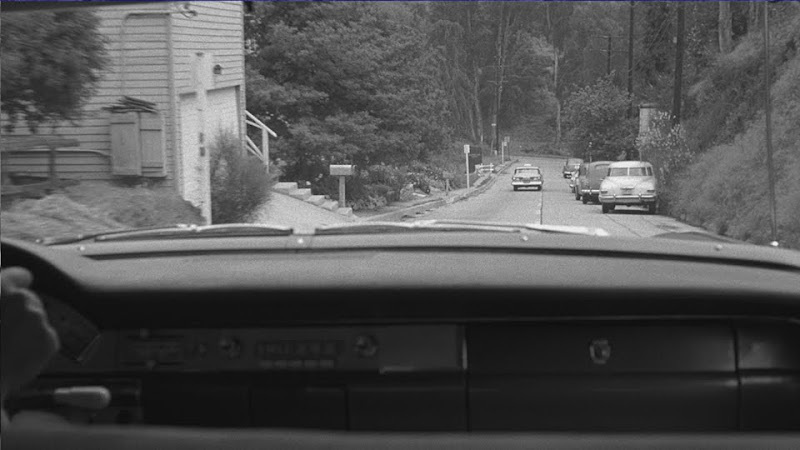 This is Laurel Canyon, before Morrison, Joni, before John Holmes. And what is fascinating in retrospect is that this location is less than a mile from Lookout Mountain Laboratory, the military's "secret" facility for preparing and processing photography of the U.S. nuclear weapons program. This facility was busy developing images of the Hardtack series of 'plein-air' nuclear detonations (which, in a series of 72 explosions, tested the response of over 18,000 G.I.s to various levels of radiation exposure - more ominous and undisclosed than the testing of prisoners in City of Fear) even as Lucien Ballard was perched in the backseat of this Ford in the hills above the Strip. Just another register of the "vast State secret that rumbles beneath ... the narrative..."